If you have a corrupted Transcend Memory card ,Repair it by using Transcend Autoformat v1.8 software .Download Transcend Autoformat v1.8 tool and format Transcend memory card . 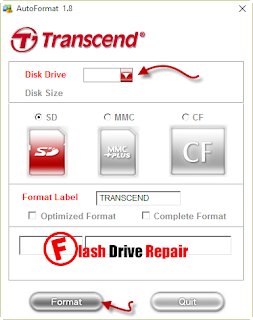 Transcend Autoformat v1.8 recovery tool has been designed for formatting unformatted Transcend memory card "SD ,MMC,CF " .Transcend Autoformat v1.8 utility can also repair Transcend USB flash drives that have VID =8644 , PID=800B when the flash capacity defined as 0 GB or RAW file . Don't use Transcend Autoformat v1.8 software with another Brand , it will not work only with Transcend SD cards ,MMC and CF .If you have Transcend flash disk , you must know it's information first before you use Transcend Autoformat v1.8 program . To determine your flash drive information , please read this articles first " Chip genius software or USB Deview V2.30 utility. Please Read this article to know how to extract your flash drive information "How to repair corrupted flash disk " . How to repair Transcend memory cards ? First Download Transcend Autoformat v1.8.rar from any download link below . Insert your corrupted Transcend memory card to your computer . Extract Transcend Autoformat v1.8.rar and You must run the software "AutoFormat.exe file " as Administrator "Right click on the software and choose Run As Administrator " . 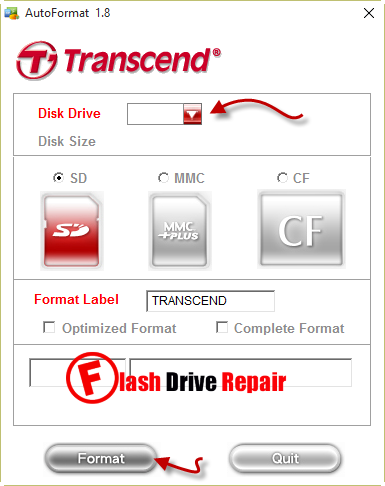 Choose Transcend SD card Drive name then choose the Transcend memory type "SD or MMC or CF " . Click Format to begin formatting your Transcend memory card . Wait until finish formatting your Memory card .